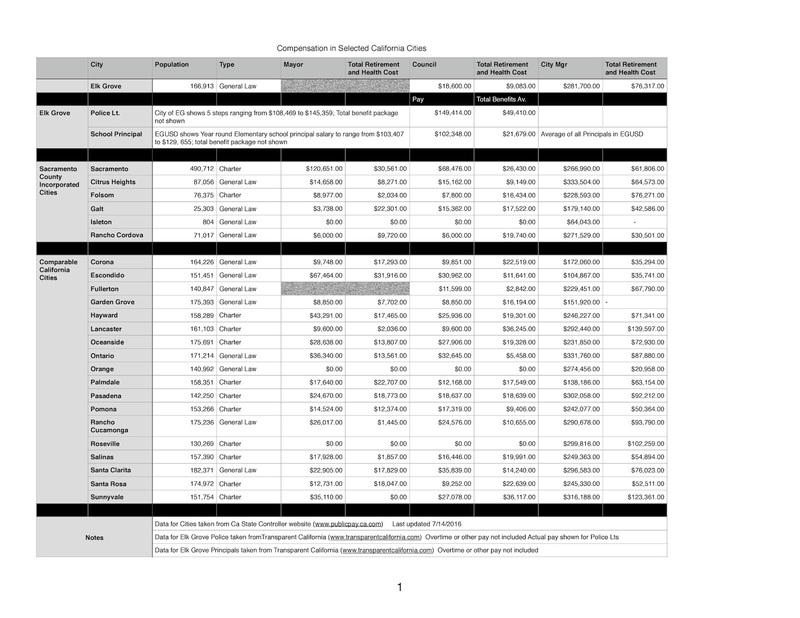 The following information and spreadsheet was compiled by an EGN reader comparing Elk Grove's pay rate for council member to similarly sized cities in California. The information was culled from TransparentCalifornia.com. Additionally, the reader submitted comments that are included below. 1) At the end of Wednesday's Council session, the Council convened was the City's Financial Authority. When they do so, after taking role, the City Clerk will read a statement stating that the members are not receiving any additional compensation for serving on the Finance Authority. [Elk Grove City Councilman] Mr. Detrick immediately stated that "I hate when that happens." It's on the video. [See video below]. 2) Salary schedules for the City of Elk Grove show that a police Lieutenant makes between $108,469 to $145, 359 depending on step. The city shows 5 steps for each position. The website Transparent America shows what each member receives in salary. Each of Elk Grove's Lieutenants (serving a whole year) were paid $149,414. This was before Overtime was included and does not take into count the average benefits package (health insurance, retirement,etc.) That package averaged $49, 410. 3) EGUSD has payment rates for a number of elementary school Principals, depending on school size and whether the school is year round. Using large year round elementary school (over 400 pupils), a Principal's pay would range from $103,407 to $129,655 per annum, again not including benefits. In using Transparent California's website, the latest figures were from 2014. Salaries ranged from $92,000 to $115,000 with average benefits package averaging $21,906. 4) And this is my opinion only, the Mayor's job is not a full time job, nor are the City Council jobs full time jobs. My opinion is that the Mayor makes it a full time job not to satisfy the demands of the job but to reinforce elect-ability on a two year electoral cycle. Visibility equals advertising. To receive a PDF copy of the comparison chart above, email editor@elkgrovenews.net with PDF in the subject line.